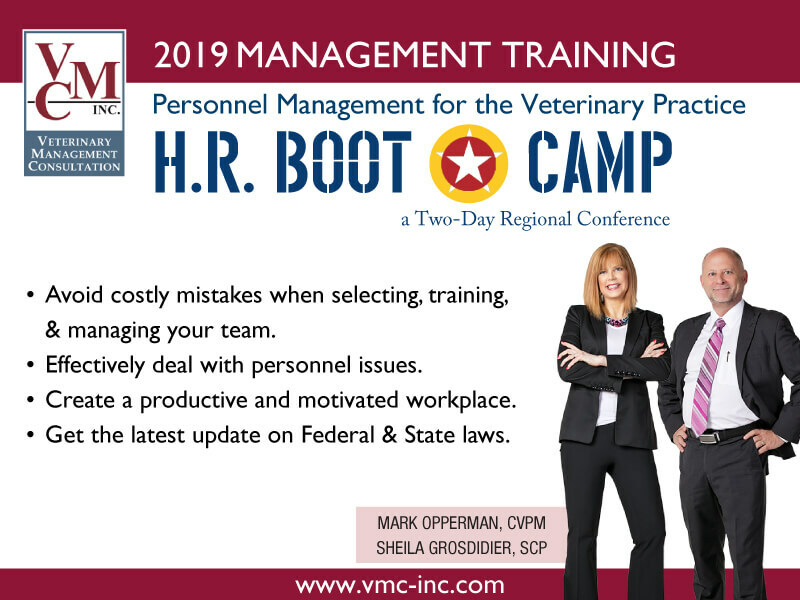 Human Resources Boot Camp - Veterinary Management Consultation | VMC, Inc. The top challenge of any flourishing veterinary practice is human resources. Your practice will not succeed without an effective, well-trained, and fully engaged team. Even if you currently aren't quite sure what HR is all about, this lively two-day program will enable you to walk out with the knowledge and resources of an HR manager superstar. Recruiting, hiring, training, developing, and retaining team members. Policies and procedures (including the dreaded employee manual). Developing a top-quality team can be expensive, time-consuming, and frustrating. Here is your opportunity to make it cost-effective and creative instead. We'll teach you how to achieve your HR goals, gain insight about real-world situations, and find practical solutions. Learn the secrets to retaining valued team members, and create a workplace culture that's positive and productive, making your practice the clinic of choice. The Hiring Process: Learn how to create a resource pool of applicants that will allow you to hire “10” employees. Policies and Procedures: You’ll develop an employee manual for your veterinary practice to include the appropriate policies, procedures and legal requirements. Performance Planning and Evaluation: Learn new and exciting ways to handle performance planning and evaluations, and look at various incentive programs. Common HR Mistakes and How to Avoid Them: We’ll discuss requirements for documentation and employee law. Handling Personnel Issues: Learn to get involved and when to stay out of the situation. Compensation, Benefits, Motivation, Delegation, and Discipline: Learn the techniques to become an efficient delegator and how to motivate your team to greater practice success. If termination is necessary, learn the “broken record” response and other techniques to liberate employees professionally and without consequence. What To Do Next: Each participant will leave with an action plan to implement immediately back at the office! Tuition Fee: The tuition fee is $685 per person. The fee includes all workbook materials, seminar instruction, 2 continental breakfasts, 2 lunches and refreshments during the 2-day event. Please note that tuition does not include lodging or parking expenses. Registration Confirmation: All registrants of our H.R. 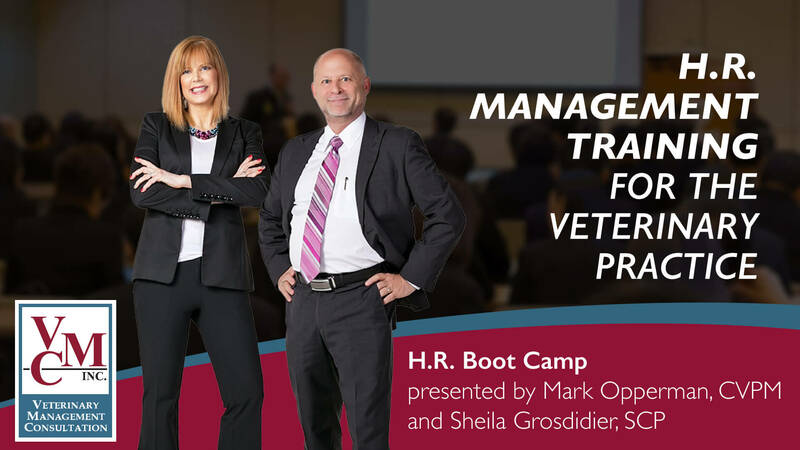 Bootcamp for Veterinary Practice Management training seminar will receive a confirmation and receipt within three business days of processing registration. Cancellation Policy: You may cancel your registration for the H.R. Bootcamp for Veterinary Practice Management course up to 14 business days before the seminar. Your registration fee will be refunded, but there will be a $25.00 service charge. Cancellations 14 days or less before the event will forfeit your tuition. You are responsible for your own lodging reservations. Workshop Locations and Lodging: A small number of rooms have been held on a first-come, first-served basis. Please call the hotel directly to make reservations for the “VMC Group Rate.” Please note rates and cut-off dates below. "Can't afford not to come. As always with VMC - very PRACTICAL - put it to work immediately!" "This course is essential to anyone who is in veterinary practice management, whether you are a seasoned veteran or a newcomer." "Learning to prevent potential problems before they become a reality - it is really time consuming to try and figure this out on your own - this class is a great value!" Reserve room by 5/20/19 to obtain VMC Room Rate of $169.